We aim to be client-centred. We suggest breaking projects into stages in order to provide natural break points where you have the final say as to whether and how we proceed. For time-critical projects we will email progress summaries at the end of each week. Design concept generation, review and selection. Includes review of candidate manufacturing processes. Detailed design generation of component, tooling, fittings and test fixtures. Detailed analyses including finite element analyses are performed at this stage. 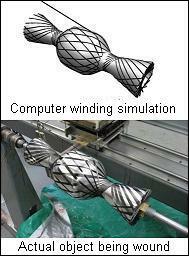 Our core capability is filament winding. 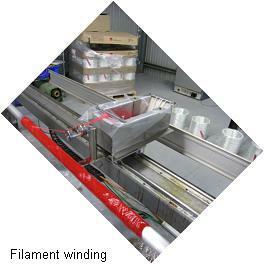 Filament Winding: Resin-impregnated filaments are drawn onto a rotating mandrel. They are laid precisely layer by layer in pre-determined patterns, usually by computer-controlled machinery. The filaments: These give strength and stiffness to the composite material. 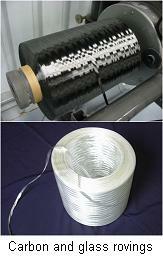 They are usually made from glass, carbon or graphite; more rarely aramid, polyethylene, boron, basalt etc. The filaments are very fine - approximately 7 micrometres for carbon fibres and 24 micrometres for glass fibres. 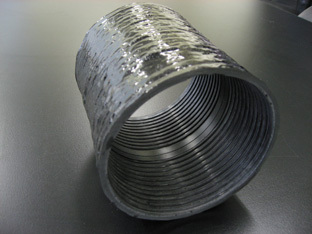 Thousands of continuous filaments are bundled into "tows" or "rovings". 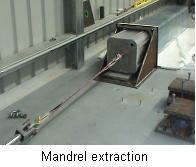 Mandrels: These form the internal surface of the filament wound part. 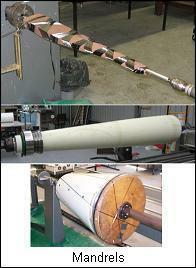 They usually have circular cross-sections, such as pipes, pressure vessels and golf shafts. Other shapes can be wound, however. 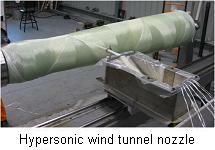 They can be made from many materials such as steel, aluminium, foam, wood or plaster. They can be monolithic (extracted in one piece), multi-part, collapsible, frangible or soluble depending on the shape of the part. They are usually coated with a release agent to prevent resin adhesion. 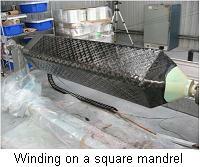 It is difficult to lay fibres axially, which is desirable for maximum bending or axial strength and stiffness. The lowest practical winding angle is about 10 degrees from the meridian of the mandrel, which entails a small performance deficit.